Today’s guest writer is Robbi Hess, Story Editor at Positively Woof. Robbi is writing about how to puppy-proof your home. Spring is a time of rebirth, renewal and a time when many families welcome new puppies to their home. 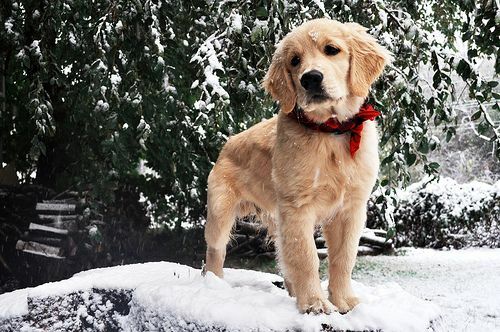 If you’ve ever been a puppy parent, you know that, just as toddlers do, a puppy will get into anything and everything — usually things you don’t want them to get into! Look for potential hazards. Are there electrical cords your puppy could trip over, get tangled up in and pull a lamp (or other object) over onto himself? 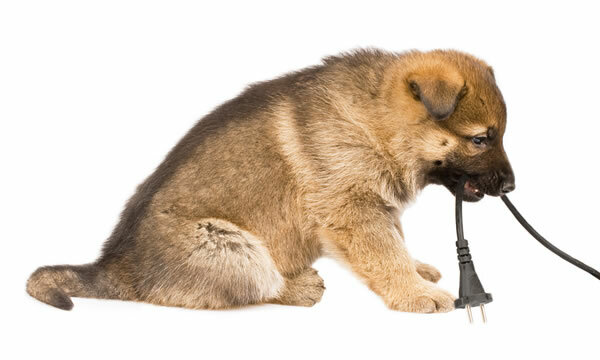 Are there electrical cords your puppy could chew on? Hide wires and cords so your puppy can’t get to them. Cover electrical outlets to keep your puppy from getting shocked if he decides to lick it! Blockade areas. If your puppy could get under your bed or the couch or other pieces of furniture, set up temporary blockades to keep her out of there. A scared puppy could scoot under the bed and it might be difficult, if not impossible for you to reach her and get her out. Also, if you have other pets in the house, you simply don’t know what they might have pulled under the bed with them. Pick up small items. If you have children in the house or if you have knick knacks and collectible items, get them up and out of the way of the puppy. Children could have toys that are small enough that your puppy could swallow them and harm himself. Collectible items could get knocked off and broken and those items could cut your puppy’s delicate paws. Trash can. Puppy-proof the trash can. Puppies have strong senses of smell and the trash in the can will be a beacon for his nose. He will be very motivated to get to the “good stuff” inside and you may find yourself coming home to an awful mess! Move the trash can to an area the puppy can’t reach it. Put it under a cupboard with a child-proof lock. Move the trash can into an area of the house the puppy can’t get into. Litter box. It’s gross, but many puppies love the cat litter box. They will eat the contents. Not only is it disgusting, but many of the litters can cause harm to your puppy — especially those that “clump” when they come in contact with liquids. If ingested these could be dangerous, if not deadly, to your puppy. Remove hazardous items. Many houseplants can cause illness or death to dogs (and cats) if they are ingested. Move houseplants to a place your puppy cannot reach it. Make certain all cupboards are closed tightly so puppy can’t get in and ingest household cleaners. If you have an overly-curious pup, invest in child-proof locking mechanisms to keep the puppy out of cupboards and drawers. Move chewables. If you don’t want your puppy to chew your favorite shoes, you need to pick them up and keep them out of reach. Puppies are chewers, there is no way around that. They will chew almost anything they can get their mouths on. Pick up shoes, jackets, books, clothing from the floor (keep clothing in a hamper to keep it safe from your puppy). Puppy level. Get down on the floor, at your puppy’s level and look for any potential hazards you may not have noticed while you were walking around your home. Puppy safety. It might make sense to put your puppy in a crate when you’re not there to keep him out of harm’s way. Or use a fence to keep him out of specific areas of the home or to keep him in an enclosed space with you. Train your puppy. Use positive reinforcement to keep your puppy safe from harm. If he starts chewing your shoe, take the shoe away and give him a puppy toy to chew on. Puppies have to chew, just make sure they have toys that are safe for them to chew upon! Enjoy your new furry family member!